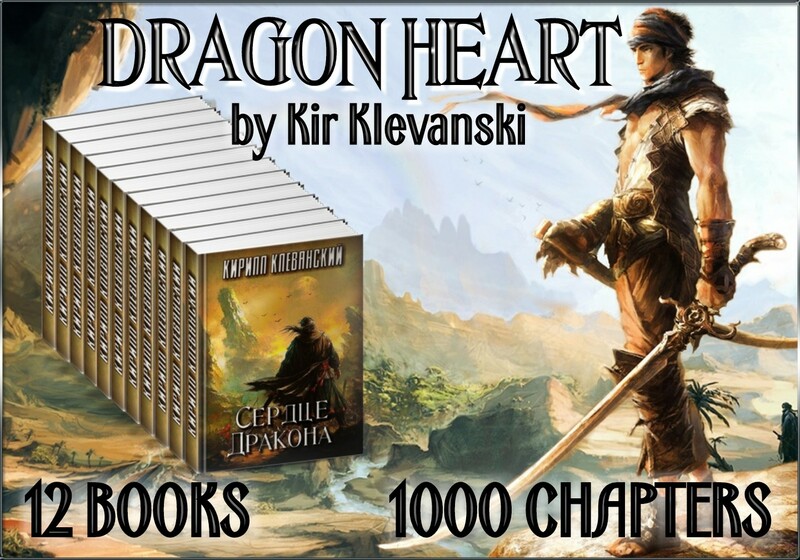 "Dragon Heart" is one of the top-rated Wuxia LitRPG novels in Russia. The author has been writing the story for only one and a half years, however, it already has 1100 chapters spanning 12 books. The whole story is planned out and will have over 2000 chapters and 20 books. The version in Russian has been read over 10,000,000 times. This story has made Klevanski the #1 or #2 author on the 4 biggest self-publishing sites in Russia. Right now, "Dragon Heart" is being translated into English and published chapter by chapter on several American sites. HERE ON RR IS PUBLISHING THE SECOND BOOK OF THE SERIES. He’d only received a neuronet and meaningless desires from his past life. He’d dreamed of adventure and freedom, but those dreams were taken away from him. They took his Kingdom, they even took his destiny. Even if a whole army opposes him, his sword won’t waver. Even if the Emperor sends entire legions against him, his step won’t falter. Even if demons and gods, heroes and villains alike, unite against him, he won’t bend to their will. His own will is iron itself, unstoppable. This novel contains uncensored scenes of battle that may or may not include depictions of violence and gore. Read it at your own risk. Oh, it is not bad. Most fiction around here is just a fraction of the quality of this story, but this story is not really that good. How the story is told is okay. Nothing spectacular but it is not horrible. It does convey the story well and maintains a constant pace. It do have problems. These are small problems but the story could have been told better. One of it is the prologue. Prologue has the reputation of being bad and or pointless . . . and this story's prologue kinda continue the reputation. First though, I should say that the prologue is not really a prologue but a chapter that is put out of order. It is a chapter that tells a scene that happens later, very much later, into the story. Technically, the story starts In Medias Res and the author just labels the out of order chapter/scene as prologue. The chapters that chronicles the events before the In Medias Res chapter essentially are just backstories. Stories that starts In Medias Res often employs flashbacks and a non-linear structure for telling the earlier events. This story doesn't do that. It threats all this chapters as regular chapters . . . but they aren't. Again, this would not have been an issue if the first chapter was really prologue, but it isn't. This results to a rather mangled start. These first chapters and everything the author tries in there just falls flat. Oh! The protagonist is in danger . . . but we know he would not die. Oh! He got deformed . . . but we already know that he would get deformed. The protagonist is looking for some medicine to heal himself! . . . but we already know he would fail to find it and that he would find a better alternative. Essentially, the author is wasting your time with these chapters. In actual In Medias Res structure, the story wouldn't bother telling all of these but instead show only the key points through flashbacks or give information about previous events as backstory. And there is also the Telling issue. Show don't Tell is a common advice for a reason. Showing is important to make the story immersive. This isn't a big issue with the backstory chapters because these chapters shouldn't be their own chapters in the first place, but not so after. It makes things lack depth and dimensions. And the infodumping. Seriously, many of the chapters are mostly infodumping. And there is also the POV. There are just moments when the POV is mangled. They are not common but they aren't really a good practice, especially in the way the author used those out of POV moments. Still, overall, the author doesn't do that bad. Even though there are a lots of fault in the way the story was told, the author doesn't forget that he is telling a story, unlike many out there. The story doesn't go in tangents that should have been left out. There aren't multiple POV's that follows characters we shouldn't be following. There aren't events that happens for no reason and which ends up going nowhere. The author keeps the story in solid focus. This makes the story enjoyable despite its flaws. How should I say this. The story is kinda strange. The story is a mix of the eastern style stories and western style stories. The results is kinda interesting but not really all that good. It mix the tropes and cliches of your classic western stories and classic eastern cultivation stories. The result is kinda interesting as it brings a new twist to these tropes and cliches. However, this creates a problem. The story ends up lacking in identity. The tropes and cliches doesn't exist in vacuum. There are expectations, associations and meaning attached to them. Let us take example, the dragon, there is a dragon in this story. An East and the West has different association with dragons. In China for example, dragons are associated with emperors and is a symbol of imperial power. The West associates dragons to evil and greed. It is these conflicting associations where the story doesn't work. The story just doesn't bother to untangle things resulting to a story that is kinda of a mess. The expectations and associations you have with the tropes are just mixed up which result to the trope losing its power as a trope. It doesn't affect you as strongly as it should have. This story also kinda falls to the bad tropes and cliches. One trope that is so ubiquitous in this story is the Redshirt. Redshirts are characters whose purpose is to be killed. They often die soon after they are introduced. The bad thing is, the author tries to extract drama out of these characters . . . you just can't. You can't extract any emotion of the death of a characters that we barely know, just seen a few times and are supposed to die. There is also the fridging of various characters. Fridging is when a character, usually one that is close to the protagonist and usually is a female, is killed, tortured, raped, etc. to provide motivation to and invoke emotion from the protagonist to forward the narrative. Fridging has acquired a very negative reputation because of how it tends to be executed. This story does fall to the many problems this trope is known for and anyone who is familiar with this trope would find this story's use of the trope rather repugnant. With all these these character deaths is a rather unfavorable result, death lost its meaning in this story. If a character dies, you barely cared. That character is just a statistic. One in a million. Death works well when it is used sparingly. Too much and it becomes a mundane thing. This story uses death too enthusiastically that it lost its effectiveness. The editing is well done. There are some errors that escapes notice but we can't really eliminate everyone of them. So Good. And this is another aspect where this story kinda failed. The only solid character here is Hadjar, the protagonist. Everyone else is not worth mentioning. Hadjar is your typical strong willed character. He received a lot of grievances but doesn't succumb to them, waiting to get his chance at revenge. This is a really popular character type and the author uses it effectively. Now, to the other characters. Of course there are the aforementioned redshirts. They often die the moment they are introduced. They don't really qualify to be called characters. They are just disposable objects of suffering and death. The fridged characters aren't any better. They are there to provide motivation for Hadjar. They don't really matter much as characters either. There are also the cliche villain, the plot device dragon that just last for single chapter . . . I can't remember anyone else. The characters in this story doesn't really qualify that much as characters. They are more like plot devices and props than anything. Overall, the story is well executed but the materials it is working with are just sub par. This story is enjoyable more because of how it was told than because of what is being told. It is like your typical pop corn flick. This story is an enjoyable read, just lower your expectations and don't analyze it too much like the way I did. Overall this is a decent story following classical fantasy tropes. Revenge, a good king being toppled by a jealous relative for greed. The prince crippled but seeking revenge. It's also a cultivation world and that doesn't mesh all that well with the main plot. The cultivation reader wants awesome power leveling, not watching a tragedy unfolding for 150 pages. So we get an in-media res start before jumping back to the very beginning of this story. That serves to actually reasure the reader this isn't just going to be a tragedy and shows the background of this story, but it seems like a bad compromise. Being hyped for cultivation you've got to slog yourself through 150 pages of fantasy tragedy. And once you've accepted the way this story goes a miraculous change happens. Overall this is a well written story, with great imagery, but I can't find myself to like its structure. 150 pages of flashback is a bit too much for me. Alright Folks, We've Hit Gold! I haven't written a story review on RoyalRoad in years because as I'm sure you all know, writers here have a tendency to abandon stories for new ones as different worlds take their fancy, or disappear altogether, and writing a review tends to make me to attached to a story. It's not altogether a phenomenon unique to Royalroad either; it happens with even well-selling authors on Amazon (RIP Brent Roth). That being said, this time we hit the motherload! There are already ELEVEN books written in Russian. The motherload of motherloads. In terms of story quality, it has the game elements and even some wuxia elements to it that we all know and love, with what seem like decently fleshed out characters thus far. I can't promise you the story will increase or even maintain quality as I can't read Russian to get some advanced information, but the idea that this one could somehow be dropped with so much already written seems superfluous, and at some point, even if the story quality ebs and flows, at least we're getting consistency here no matter what happens. Sometimes you just want to enjoy a longer lasting story, and that looks like what we have here. Follow/favorite this one, I've got a good feeling here. Devoured the prologue and first fifteen chapters. I feel like a drug addict! I need my next chapter fix man! This is a great book so far. I have neve read a book of this genre before. I have read a lot of LitRPG, and I think I like this just as much. I keep thinking I need to learn Russian so I can read my favorite books faster! Mind you, this is a really well written story so far, and it is definitely written in a manner where it certainly catches the reader's attention thoroughly and forces them to keep reading despite the fact that they are well past their bedtime lol. The only problem I have with the story is the fact that, there is a bit too much foreshadowing of the future. In the sense that we are told what has happened like 10 years in the future, and then the story takes place in the flashback. Now this is neat the first couple of times you do it, but after it just turns a bit annoying as you already know where you are going as a reader and just wish to reach that point asap so that you can move forward with the rest of the story. Another thing that annoyed me was the fact that the main character didn't change his name regardless of how common the name Hadjar is. But seriously, reading the story so far and how meticulous the author has been about his/her plot, I am almost certain that this was done on purpose, but it still doesn't make it any less annoying in any sense. Lastly, I believe a separate chapter should be posted to list all the cultivation level/skills and jargon related to the story that pops up simply due to the fact that the stroy is being updated almost daily and a lot of readers might forget the jargon if they haven't been checking up on updates a lot. A chapter listing the different skill that allows us readers to view back at quickly would definitely help in that regards. Also, the grammar is as close to perfect as you will get on the site, the characters have some depth to them, they are not the simple crap that you see in most cultivation novels on here wuxia or qidian. Good job, you should definitely take some good cred for yourself when it comes to characters, they were all very well fleshed out and allowed us as readers to connect to them. Personally, I would love for you to sort of explore that more as from what I have read so far, Characters might perhaps be your niche, maybe a slice of life short story in the future for you as an author? Keep up the great work, and please don't take the slight criticism up there in any negative manner, this is a story that is meant to be written in an epic manner and red in one as well, and so far justice is being done, hence the high rating. Hope to see updates more frequently, cheers! What happened? This story had such a great start! I didn't even mind him being nerfed but the style completely changed. Before it was written in relatively ok English but the past few chapters (30+) have turned into boring wuxia fare. Too much fluff and repetition. This isn't worth reading. I like this story, but one of the problems I find early on is the rather long beginning. I'm one who appreciate when the mc has to face some hardships, no trouble with that. But the fact is that some people can't handle to read 20 chapters of mc being thrashed. Sure, some people may appreciate such a development, but I think one has to be careful with such an approach overall. Otherwise, I really appreciate the story, which from what I can see seems very detailed. Characters are also easy to remember, and leaves a good impression on you. Overall I like everything about it very much, but I would like to casen the overall readers that the beginning is slow, and also that it contains small doses of hope, but even bigger doses of despair! Glad to see a good book!